It’s the holidays and there’s no better time to get crafty!! Awhile back, I made a list of all the crafts I wanted to complete for our home (for the holidays). Some were easy, some hard… but all were inexpensive! I have been hard at work gluing, wrapping, cutting and crafting some really fun decorations. As it happens, a yarn wreath was on the top of my list! 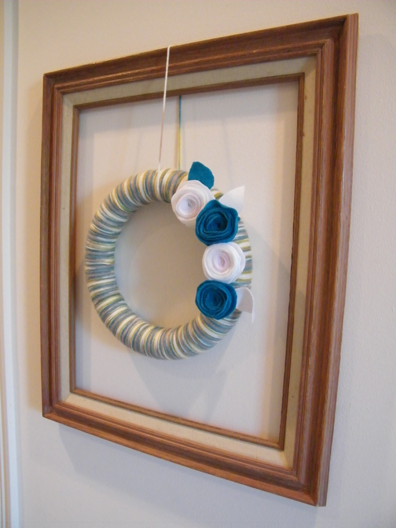 I was browsing through TJ Maxx awhile ago and spotted the cutest yarn wreath for around $20… although I am interior designer and do buy right off the shelf or design my own décor for clients at that price or higher, for me and our home… I do get crafty at times! At right around $5 for this craft… the Mr. was so proud! 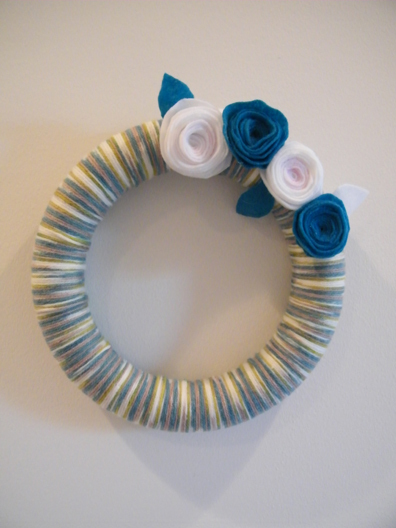 Ready to make your own Yarn Wreath? Step 1: Pin the end of your yarn string to begin wrapping. 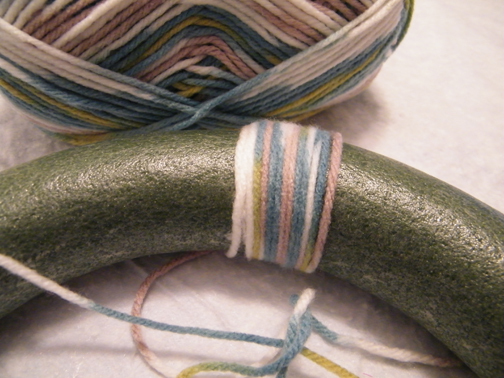 Step 2: Wrap wreath with yarn. You will want to keep it tight, and keep in mind that it is close to impossible to have the yarn perfectly lined up on the entire wreath. 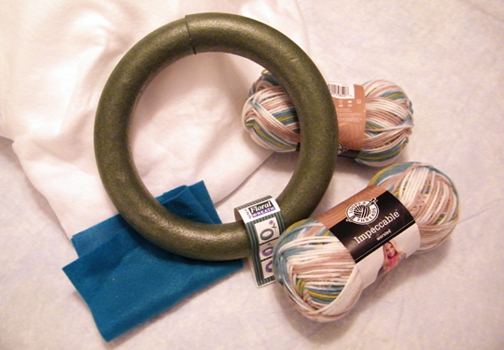 * My ring was small so I didn’t even use one roll of yarn. 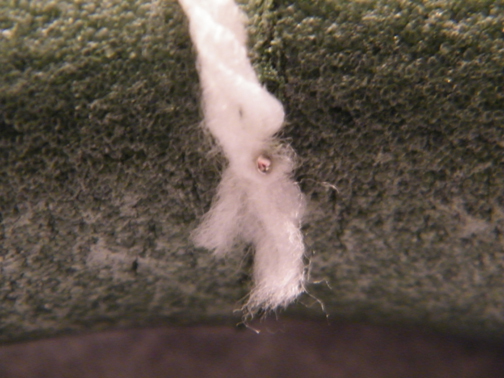 Step 3: When you have your entire ring wrapped with yarn, cut the string and pin the end into the ring. – Cut a circle out of felt. Keeping in mind that the bigger the circle, the bigger the flower. – Cut around the outside of the circle to make it have a waved look. 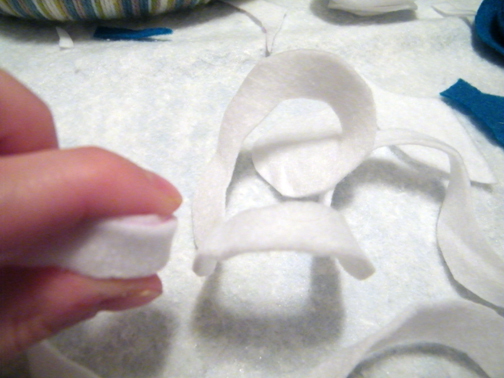 – Pick any point on the circle to start cutting the felt. 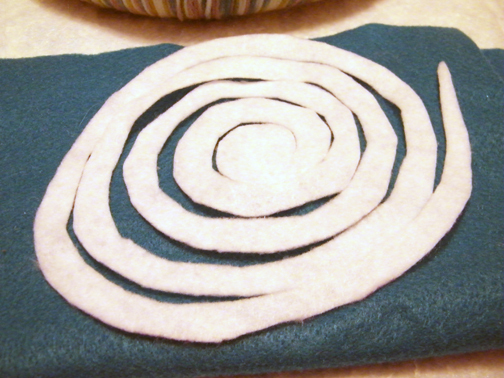 You will be cutting a large spiral shape so that you will end up with one long thin strip of felt. 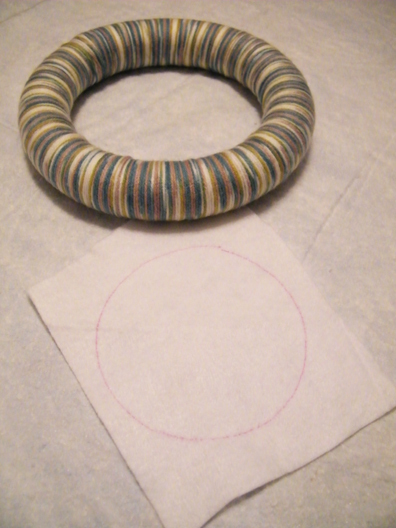 – When you get to the very end, you will have a circle or oval shape left that you will want to leave and not cut into. This will be the base of your flower. 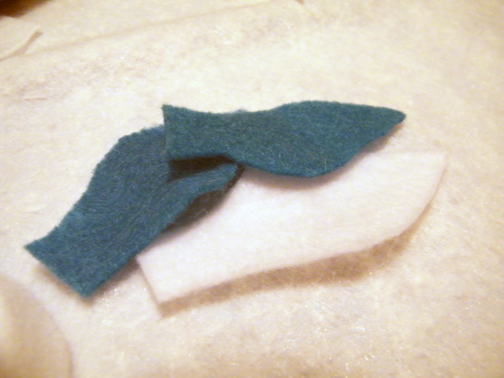 – Take the end of the felt where you began cutting and start to roll. You will want to keep it tight in the beginning so it holds. If you want a smaller more circular flower, keep it tight. If you want it to have a more open look, you can keep it a little looser as you roll it. Step 5: Glue the Flowers by taking the extra circle on the bottom of each flower and glue to keep each one tight. Step 6: Cut out a few leaves to add the flowers. First I hung ours by itself in the hallway upstairs, but it looked a little lonely… so I grabbed a frame out of the closet and hung the yarn wreath from it. Love It! It gives it a bit more personality and actually looks a little like “country Christmas”! What do you think? Have you been doing any Christmas Crafts? Do Tell. IMAGES COURTESY OF A DESIGN STORY, LLC. We joined up with Somewhat Simple’s Party & Beyond the Picket Fence. 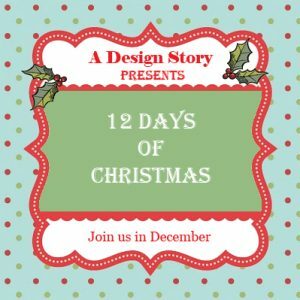 Haven’t seen the other posts in our 12 Days of Christmas? Just click the image below! 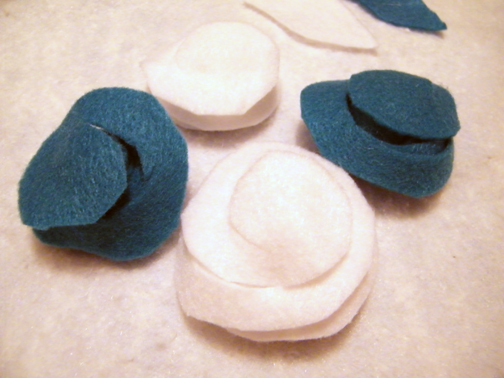 I love the colors in yours and I really want to try my hand at making the felt flowers. Thanks for sharing! Me too! I have been wanting to try one for awhile… So glad I did! Really easy and inexpensive! Let me know how your felt flowers go! It turned out Great!!! Love it!!! it turned out perfectly! i love the yarn you chose. I love the yarn wreaths. I made a variation of this. 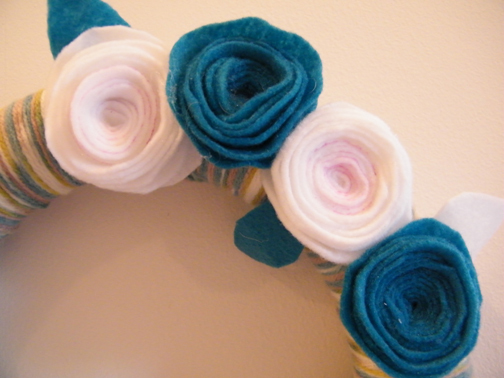 You can check it out over at http://pathb4me.blogspot.com/2010/12/yarn-and-button-wreath-tutorial.html I love the colors in yours and I really want to try my hand at making the felt flowers. Thanks for sharing! Melissa, Me too! I have been wanting to try one for awhile… So glad I did! Really easy and inexpensive! Let me know how your felt flowers go! Isn’t it funny how the Holidays bring out the crafty in us? Thanks for posting your wreath. I’ve been wanting to make one and I appreciated seeing the step by step. I think having the frame around it makes all the difference in the look. Very cool!